Struan Grant Ralph is a Scotsman of a different kind a�� the globetrotting variety. 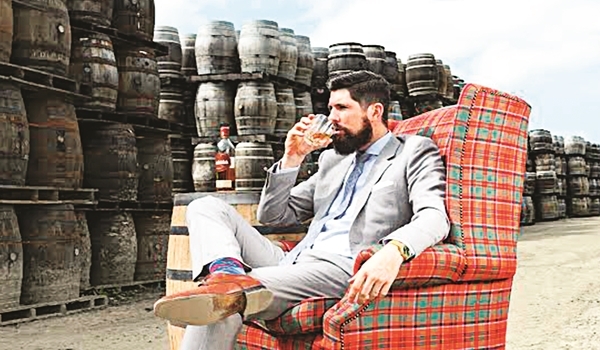 As global brand ambassador of Glenfiddich whisky, he lives out of a suitcase and hops on and off planes more times than we can say slA�inte (the Scottish toast meaning a�?good healtha��). But in that suitcase he also packs his kilt, sporran and a dry sense of humour. All of which were on show at a whisky paired sit down dinner at the ITC Gardenia in Bengaluru last week. Glenfiddich has been around longer than our forefathers, having entered India in 1909, brought by Glenfiddicha��s founder-owner William Granta��s son-in-law, Charles Gordon to grow into Indiaa��s biggest selling malt whisky. The word whisky itself, came from the Latin phrase aqua vitae or water of life, translated to the Gaelic uisge (which then became the Scottish a�?whiskya�� or the Irish and American a�?whiskeya��). Incidentally, Ralph doesna��t live by a Scottish glen, but in buzzing New York city with his French wife and enjoys a good vintage champagne on occasion. Which whisky would he pick if he had to choose just one? He pauses a while. a�?If I had to pick a desert island whisky, Glenfiddich 12 year old would be the one.a�? And others from around the world? a�?Sullivana��s Cove, based in Tasmania, Australia is an innovative small-batch distiller. And probably a Balvenie 21 year old. A Japanese whisky too a�� the rare Yamazaki 1984. The just launched Glenfiddich 26 year old.a�? Also, Hudson whiskey from a small distillery in New York and an experimental Glenfiddich variant finished in IPA (India Pale Ale) casks are worth checking out. I chatted with him about the trends he may have spotted during his globetrotting sojourns. Whisky has a loyal band of followers who enjoy the stock age specific variants most, he adds a�� the 12, 15, 18 and 21; but the new in-thing is the popular rise of the NAS (non-age specific) whiskies, originally driven by stock constraints of the age-specific whiskies. These variants, he says, a�?Allow for more innovation by the distillers and do well because the modern whisky drinker looks beyond substance, at style too.a�? The Snow Phoenix, a Glenfiddich NAS is one, which disappeared off the shelves in a jiffy. a�?And Glenfiddich have the largest stocks of whisky in the world!a�? Look at whata��s happening with whisky around the world and youa��ll see a blurring of categories, he explains. Today whiskies come from countries all over, not just Scotland: Taiwan, Japan and countries you wouldna��t even imagine. With competition and sales growing, ita��s all good news for whisky lovers.